If a company wants to build a car that is safe and reliable, they will test it in many ways. They will use wind tunnels and crash tests to identify potential weaknesses. Similarly, if policymakers want to develop the best policies possible, they need to know how they will look and succeed in several different, but realistic, possible futures. We call these futures, scenarios. The CGIAR program on Climate Change, Agriculture, and Food Security (CCAFS) has developed and used scenarios to guide policy formulation in six global regions (Eastern and Western Africa, South and Southeast Asia, the Andes and Central America). In July 2015, CCAFS facilitated a workshop with national partners from the government, private sector and civil society in Burkina Faso to review the development of National Plan for the Rural Sector (PNSR). They were joined by researchers from different CGIAR Research Programs (CRPs) interested in evaluating their research objectives using previously developed regional scenarios. 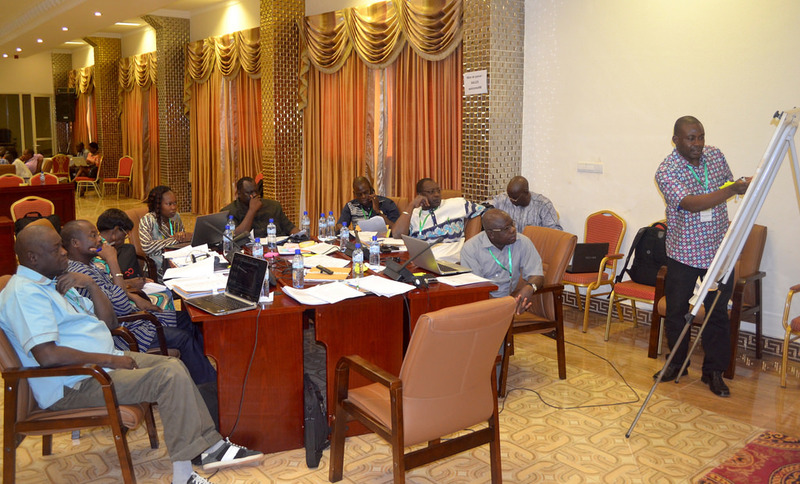 In a workshop in Ouagadougou, Burkina Faso, in mid-July 2015, CGIAR researchers, government planners, private sector representatives and other national experts met. The goal: development of the new National Plan for the Rural Sector for Burkina Faso (PNSR) and the identification of research strategies to support this plan. The tool: scenario-guided planning. Photo: Kabore Herve. This workshop was part of a broader process, started by CCAFS in 2012 in the ECOWAS region, to bring together people who work on topics of food security, the environment, and rural livelihoods to create a platform for crafting futures for how their region could develop. Stakeholders envisioned many distinct, plausible futures that each offer a mix of opportunities and challenges against which to test policies. The degree to which short-term or long-term priorities dominate strategic agendas. Agricultural development plays a leading role in all of these possible futures, because in many ECOWAS countries, including Burkina Faso, nearly a quarter of the national GDP comes from crop and livestock production. Reducing food insecurity is a challenge and understanding how improvements in crop production or livestock rearing will change the region’s demand for grassland and cropland is vital information. Yield improvements that increase the regional food supply and raise calorie consumption can be seen as a success. However, when the food supply increases through cutting down forests as a source for new agricultural land, this has long-term environmental consequences. It is important to identify such potential trade-offs. We can use models, such as GLOBIOM and IMPACT, to tell the story of the scenarios and identify and measure trade-offs. Using our model, GLOBIOM, my IIASA colleagues and I provide insights into the development of the agriculture sector, improvements in food security, and the resulting land use change. 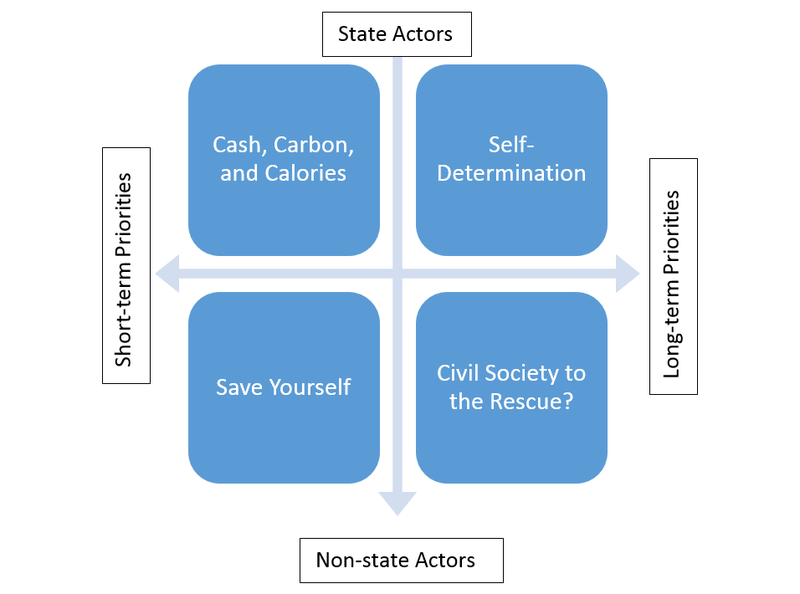 Just as scenarios can gain credibility and become more relevant to the local realities by involving stakeholders at multiple levels, models can give credibility and consistency to the scenarios by using data and consistent representations of different systems (such as agricultural systems, for example, see this IIASA research). To model these scenarios, we used input from stakeholders and scenario storylines to identify multiple factors driving change in Western Africa and put numerical values to these drivers: GDP, population, improvement in crop and livestock yields, integration of regional markets, and limit to deforestation. For all the scenarios, we also consider the potential impacts on agriculture due to climate change. For some of the factors of change we used Shared Socioeconomic Pathways (SSPs), developed partly by IIASA researchers, as an envelope of possibilities for future changes, because the SSPs are also socioeconomic scenarios that have considered many dimensions of change to look at the challenges the world may face in mitigating and adapting to a changing climate. GLOBIOM, as a global model, covers future development not only for the ECOWAS region but also for the rest of the word, providing insights to how the region will be affected by forces outside its control, such as global markets and climate change, which can have profound effects on regional outcomes. We like to call this “globally consistent regional scenarios”. After running the model we examined the results, such as agricultural area expansion and food availability, through the lens of the scenario narratives. Once the scenarios from our model results represent the future worlds the stakeholders envision we use the full scenarios (narratives and quantitative model results) with policymakers as a testing ground for potential policies, such as those used in the Burkina Faso workshop. Presenting modeling results can be challenging, but we have found ways to present engaging and informative quantitative scenarios, by focusing on the most useful information policymakers want to see for each scenario: regional socioeconomic growth and food security, development of crop and livestock sector under climate change, and changes in land use and deforestation. With successes like the workshop in Burkina Faso, where our scenarios, developed by local stakeholders and quantified by models, were well-received and useful for redeveloping the country’s PNSR as well as regional research objectives of the CGIAR, we see an example of how the IIASA goal of moving science into policy is being achieved. Havlík, Petr, Hugo Valin, Mario Herrero, Michael Obersteiner, Erwin Schmid, Mariana C Rufino, Aline Mosnier, et al. 2014. “Climate Change Mitigation through Livestock System Transitions.” Proceedings of the National Academy of Sciences of the United States of America 111 (10) (March 11): 3709–14. doi:10.1073/pnas.1308044111. Leclère, D, P Havlík, S Fuss, E Schmid, A Mosnier, B Walsh, H Valin, M Herrero, N Khabarov, and M Obersteiner. 2014. “Climate Change Induced Transformations of Agricultural Systems: Insights from a Global Model.” Environmental Research Letters 9 (12) (December 1): 124018. doi:10.1088/1748-9326/9/12/124018. http://stacks.iop.org/1748-9326/9/i=12/a=124018?key=crossref.ede85e60c69b514efa057794c8e42d9c. Müller, Christoph, and Richard D. Robertson. 2014. “Projecting Future Crop Productivity for Global Economic Modeling.” Agricultural Economics 45 (1) (January 10): 37–50. doi:10.1111/agec.12088. http://doi.wiley.com/10.1111/agec.12088. Palazzo, Amanda, Joost Vervoort, Petr Havlik, Daniel Mason-D’Croz, and S Islam. 2014. “Simulating Stakeholder-Driven Food and Climate Scenarios for Policy Development in Africa, Asia and Latin America: A Multi-Regional Synthesis.” Copenhagen, Denmark. Vervoort, J.M., A. Palazzo, D. Mason-D’Croz, P.J. Ericksen, P.K. Thornton, P. Kristjanson, W. Förch, et al. 2013. “The Future of Food Security, Environments and Livelihoods in Eastern Africa: Four Socio-Economic Scenarios.” 63. Vervoort, Joost M., Philip K. Thornton, Patti Kristjanson, Wiebke Förch, Polly J. Ericksen, Kasper Kok, John S.I. Ingram, et al. 2014. “Challenges to Scenario-Guided Adaptive Action on Food Security under Climate Change.” Global Environmental Change 28 (March): 383–394. doi:10.1016/j.gloenvcha.2014.03.001. http://linkinghub.elsevier.com/retrieve/pii/S0959378014000387.